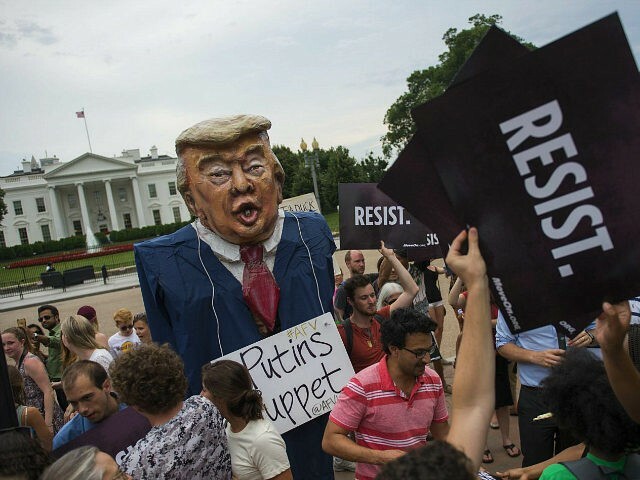 The conspiracy theory that President Donald Trump’s 2016 presidential campaign colluded with the Russian regime of Vladimir Putin is nearly three years old. Two years of investigation by Special Counsel Robert Mueller — whose report is anticipated any day now — and by numerous congressional committees have failed to produce evidence to substantiate the claim. Yet many Democrats, and journalists, remain mesmerized by what is almost certainly a hoax. The “progressive” wing of the Democratic Party could understand Trump’s win because he had appealed directly to the working-class voters they warned the party establishment not to ignore, and talked about issues, like trade, that Sen. Bernie Sanders (I-VT) had highlighted in his own campaign. Because they had a theory about why Trump could win, the far-left was less surprised when he did so. (Some may even have voted for Trump, quietly, in the Upper Midwest.) When he won, the activists of the far-left were stunned but not stupefied. They were able to organize protests, to recruit candidates, to raise funds, and to canvas support. The center-left party establishment had the resources to push back, and to maintain control. What it lacked was the will, the leadership, and ultimately the composure. The center-left convinced itself that the election must have been stolen — by Comey, or by Russia, or by “fake news” — and that Trump represented a new Hitler, a potential dictator. Impeachment became an obsession for major party donors and even among the intellectuals in the Clintons’ orbit. Terrified of the momentum the young progressives had seized, the party establishment hardly pushed back. Instead, almost all of the presidential candidates embraced the new, absurd policies. Republicans were delighted: Democrats had provided the perfect foil. Suburban voters elected Democrats to run the House in 2018 partly as a rebuke to Trump’s disruptive style. But Democrats have only delivered more disruption — and promise revolution in 2020. Former Vice President Joe Biden, still on the sidelines, represents the last hope of the party’s moderates, the only candidate who can bridge the growing divide between liberal and left. But between Bernie and Beto, there is not much room left for another white male.